This is "Rakugan". Traditional Japanese sweets. 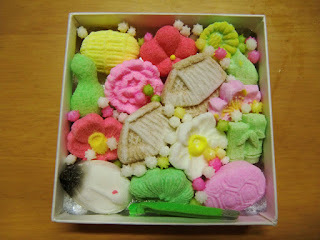 When we hold a tea ceremony,we enjoy this kind of sweets. "Rakugan" is a hard,dainty sweet made of soybean and rice flour mixed with sugar. Originally Rakugan was introduced into Japan from China,about 700 years ago. 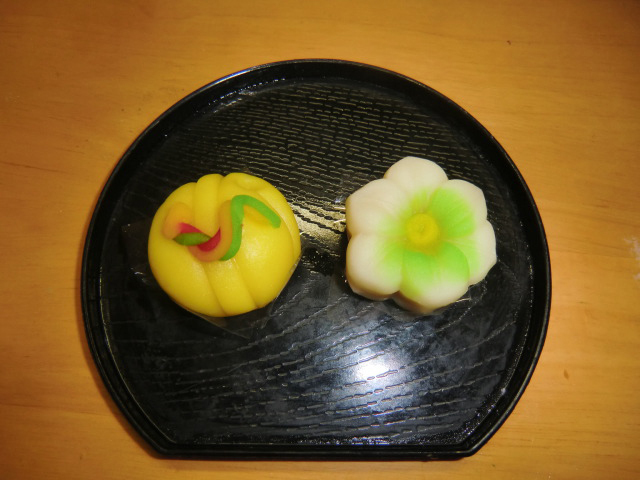 With tea ceremony spread throughout Japan,Rakugan become popular sweets in Japan. We can feel a sense of the season from them. 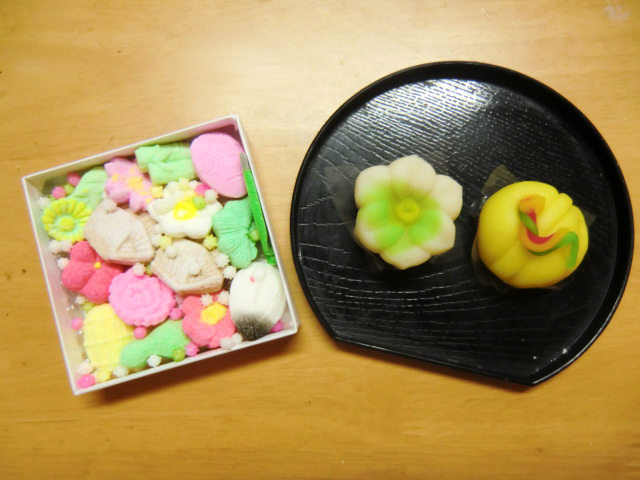 The left sweet is made in the shape of "Japanese bell". In New Year,every Japanese people goes to shrine,rings a bell,and prays to God. So "bell shape" means "New Year". The right sweet is made in the shape of "a narcissus". A narcissus is known as a typical winter flower in Japan. This flower begins to bloom in this cold season. That is why we enjoy it in this season. Right sweets,in the right season. This is the heart of Kyoto sweets. 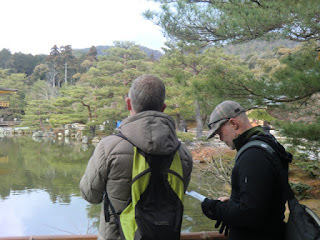 If you go to "Kinkaku-ji",you can't miss this shop. "Nichiei-ken" is the shop name. So many lovely sweets are here! 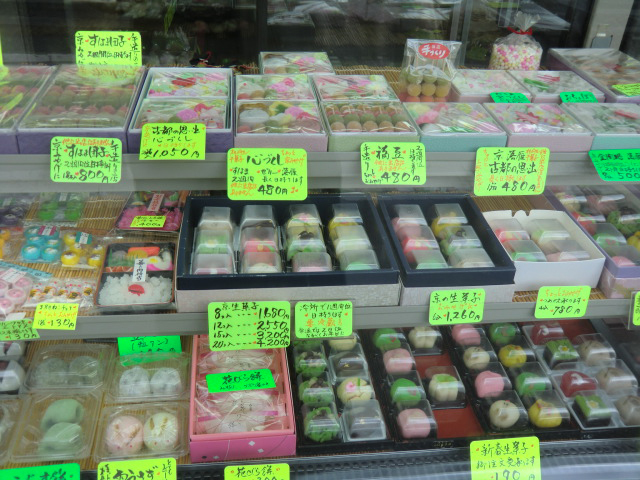 This shop is located near Kinkakuji-michi bus stop. (bound for Hakubai-chou). 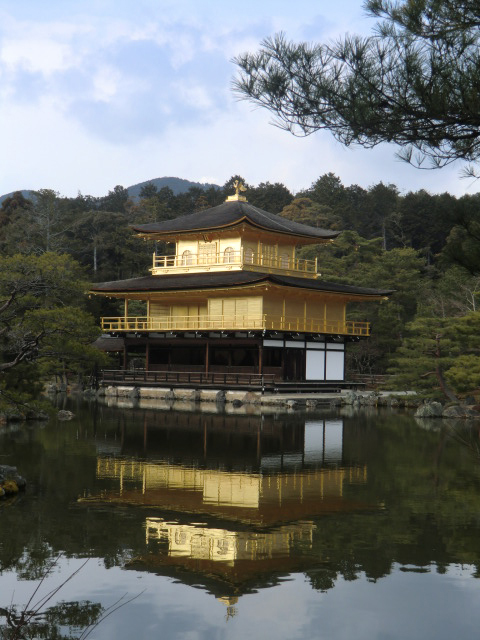 "Kinkaku-ji" is one of the most beautiful and famous temple in Kyoto. It is designated world heritage in 1994. This temple refrects its beauty on the pond(Kyouko-chi). About 700 years ago,Yoshimitsu-Ashikaga(1358-1408),a general of Muromachi era,rebuilt this luxurious temple to show his power to the world. Please look at the top of the Temple,you can see a phoenix bird. This bird is said to represent General Yoshimitsu himself. He wanted to rank himself as a top. This temple is three-story building. 1st floor was constructed in the aristocratic style. And 2st floor was constructed in the samurai style. And the top phoenix represents General Yoshimitsu. This ranking is very significant to him. This shows that Yoshimitsu wanted to show his power to the aristocrat people and Samurai people,and wanted to govern them. He wanted to show them,"I am top.Obey me." Yoshimitsu wanted to carry on commerce with China. He often invite Chinese trade mission people and entertained them here. 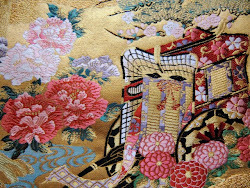 He imported weavings,books, and raw silks from China. This is a brief map. In Arashiyama,There is 3 diffrent tram line. And Keifuku-Arashiyama line(Randen) is important to go to Kinkaku-ji Temple. This is "Keifuku-Arashiyama" station. 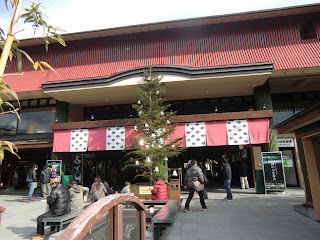 You have to find this station at Arashiyama. 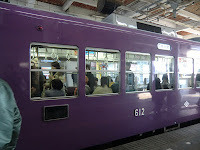 I recommend "Keifuku-line",because in April,you can see beautiful cherry blossoms from this train. This purple train is "Keifuku-line",another name is "Randen". And you have to transfer at "Katabira-no-tsuji",and head to "Ryouan-ji" station. You get off at "Ryouan-ji" station. "Ryouan-ji" is also a wonderful Temple.Beautiful garden is famous. 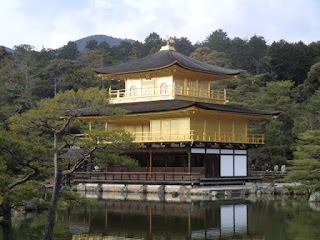 And "Kinkaku-ji" is not so far from "Ryouan-ji". 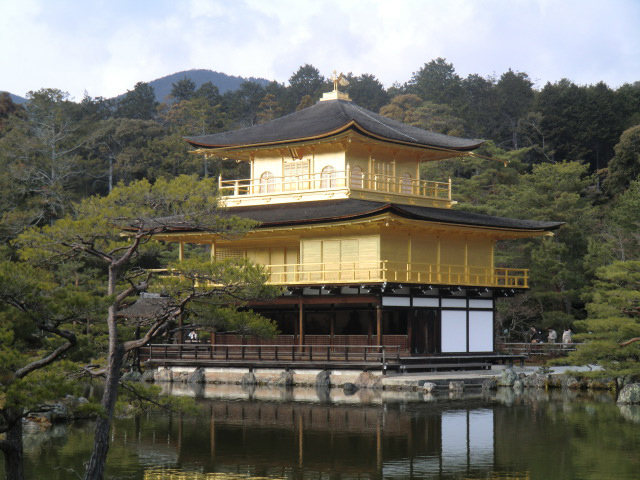 After you enjoyed Ryouan-ji, you can walk to Kinkaku-ji from Ryouan-ji. There were many tourists from abroad. This is also Yoshimitsu's big residence. He entertained trade mission people from China here. If you have time,it is good to visit this temple with a long and distinguished history. There are very good Kyoto-sweets shop near Kinkakuji bus stop (return). The shop name is "Nichiei-ken". This shop has no web site,so please see this site below.